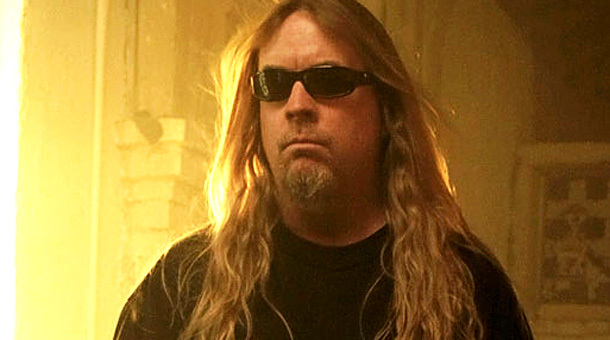 Slayer have announced a public memorial event for late guitarist Jeff Hanneman. He died earlier this month as a result of liver damage caused by drinking – a problem which, it’s been suggested, contributed to the attack of necrotising faciitis that forced him off the road in 2011. He was 49. The Jeff Hanneman Memorial Celebration will take place on Thursday, May 23, at LA’s Hollywood Palladium from 3.30pm to 7.30pm. Entry will be free but limited by venue capacity. A statement on the band’s Facebook page says: “It was once suggested to Slayer that if they would write ‘just one mainstream song that could get on the radio,’ they would likely sell millions of records and change the commercial course of their career, similar to what had happened to Metallica with 1993′s Enter Sandman. The band are planning to complete their European tour as previously arranged. Exodus guitarist Gary Holt, who’d stood in for Hanneman since he fell ill, will remain with the band. It’s not known whether drummer Dave Lombardo, who was dropped over a contractual dispute, will return.